Enter for a chance to win these two great prizes! As part of our “Helping You Get On With Life” sweepstakes prizes, this month our readers can enter to win two great prizes that anyone can appreciate. Ideal for personal hygiene and healthy skin, flushable washcloths feature a 3-in-1 formula that cleans, moisturizes and protects without drying alcohol. They’re 99% biodegradable and certified by the NSF to be sewer and septic safe, so you don’t have to worry about clogged or overflowing toilets. 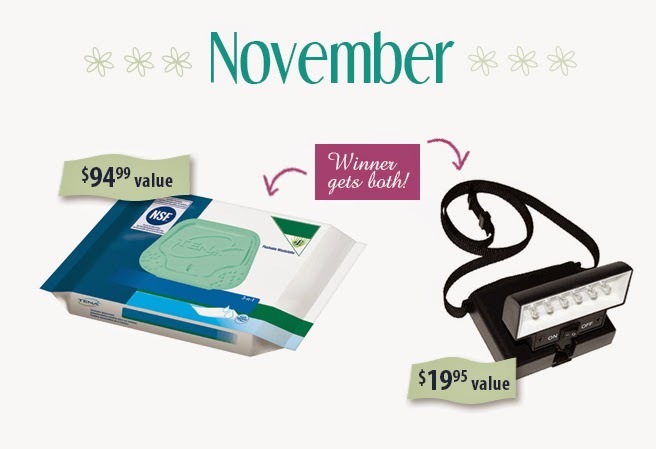 The winner receives a case of 12 soft packs, each containing 45 washcloths. A $94.99 value! Beam N Read is a hands-free light with optional clip-on magnifier and night vision setting. Energy-efficient, extra-wide LED light features high and low settings. Elastic neck strap provides a comfortable fit while leaving hands free for reading, crafts, nighttime walking and more. Valued at $19.95. For a chance to win this month’s prize package, all you have to do is e-mail us at info@caregiverpartnership.com or mail a short statement explaining why the prize would be useful to you or a loved one. We will accept entries for this prize bundle through Nov. 30, 2014, and will notify the drawing winner the first week of December. To learn more about the two easy ways to enter and preview upcoming giveaways, visit our “Helping You Get On With Life” sweepstakes page. And don’t forget to look for our December prize announcement right here on our blog!